With Eliet’s unique Chopping Principle delivering an amazing 18,000 cuts every minute and enabling all manner of garden-waste to be shredded, it’s no surprise the Eliet Primo comes highly recommended by composting-experts. Its premium-grade 4hp Honda GC135 four-stroke engine drives a series of six specially configured hardened-steel knives that ensure comprehensive shredding with no debris escaping the chop. Material feed-in is exceptionally fast, thanks to Eliet’s provision of an extra-large shredding-surface (the mechanism will comfortably take branches up to 35mm in diameter). 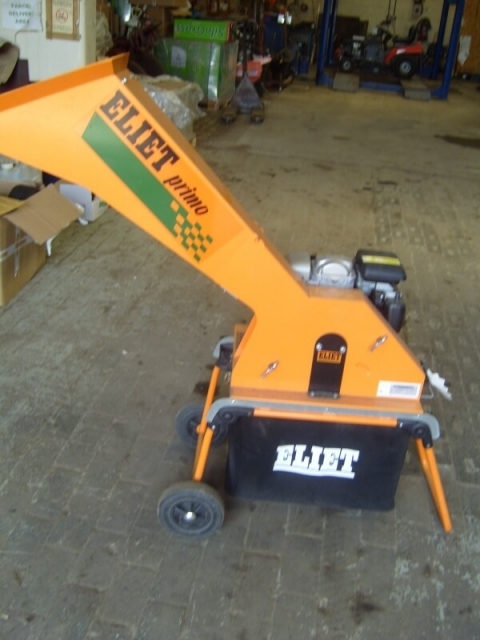 The Eliet Primo Petrol Shredder is constructed entirely from heavy-gauge steel and is finished with epoxy-based paint, so an impressively lengthy service-life is assured. It’s supplied with a very high-volume 60-litre collection-bag, so there’ll be no mess and you won’t lose any of that valuable mulch; and it features large, 20cm-diameter wheels for stability during use and easy site-to-site movement.